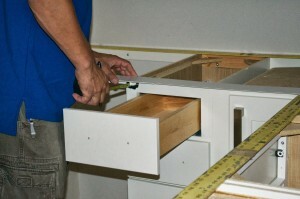 Before beginning your countertop template, make sure all cabinets are properly secured and level. The metal straightedges shown here help keep the flexible templating material flat and straight during construction. 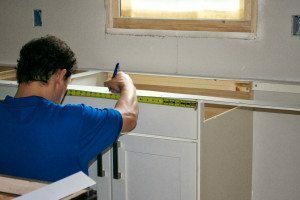 Before you begin to create a countertop template, be sure all of the cabinets are properly set. They must be screwed together and attached securely to the wall. Don’t think you can simply push them into place and start on your template. 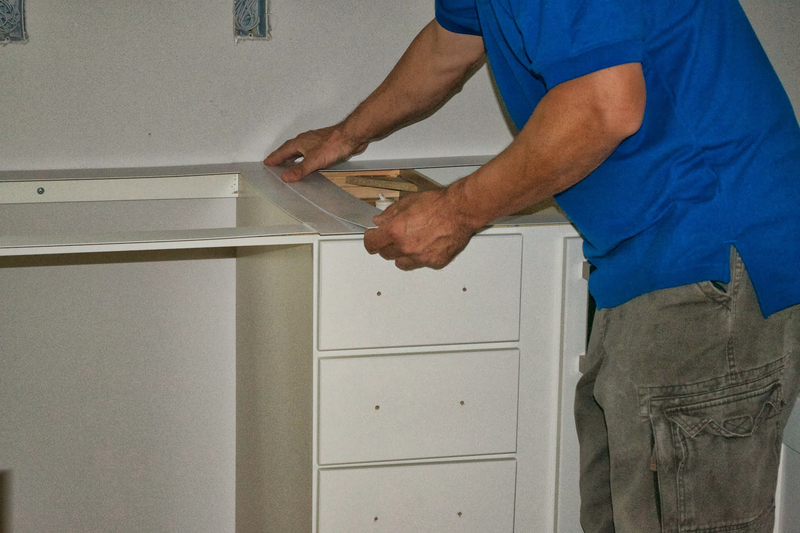 If the cabinets are moved even ⅛-inch after you’ve made your template, the resulting countertop won’t fit properly. Make sure the cabinets are level to within ⅛-inch over a 10-foot span. These close tolerances are often required as conditions of the warranty. Take careful and precise measurements as you go to keep the proper overhang throughout the entire template. 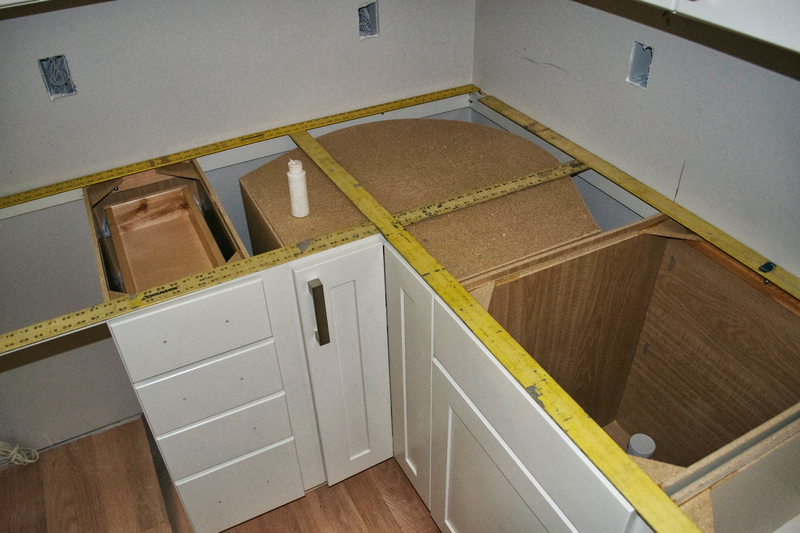 All sinks, fixtures and appliances should be on the jobsite when you begin to measure. Tolerances for fitting these items are often very tight, and it’s better to find any problems before you order the countertop so they can be fixed. A countertop template is usually made of ⅛-inch-thick strips of plywood that are hot-glued together. This type of material is inexpensive, glues easily and holds its shape well. However, you may need a large truck to be able to transport it fully assembled, as the material is too stiff to be rolled up. When the slab has a seam, you can lay two strips of material perpendicular to the front and back edges. Once the glue has set, make a straight, precise cut at the seam location and you’ll have two templates for easier transportation to the fabricator. To create a countertop template, you can also use heavy construction paper or plastic templating strips. These can be folded or rolled up after gluing for easier transport. Be aware, however, that they may require specific glues to properly adhere to each other, such as quick-drying PVC solvent for plastic strips. Write clear and complete notes right on the countertop template material. It can save you a lot of time and trouble. The details you write will vary according to the material and the fabricator’s preferences, but typically you want to include cutouts for faucets, cooktops and sinks, as well as the types and thickness of edges and profiles. When measuring for cooktop and sink cutouts, make sure you indicate whether it’s top-mounted or undermounted. Also include any special or irregular installation conditions, such as a larger overhang in one section or a section of a wall with an odd shape or profile. When the template has been properly set and the glue is dry, carefully measure and mark the centers for any cutouts, such as sinks or cooktops. You will typically start to create a countertop template by placing a long strip along the wall behind the cabinets and another along the front edge (with an accurate measurement of the finished overhang). Note if the wall is straight and parallel to the front of the countertop. If end walls are present, make sure they are square and perpendicular to the rest of the countertop. Indicate any irregularities on the template material. Areas where backsplashes will be installed typically have about a ¼-inch gap between the countertop and the wall, but it’s still important to accurately measure and note irregularities. These finished templates are an accurate reproduction of the finished countertop’s final dimensions. Glue the template together by laying the end of one strip on top of another. 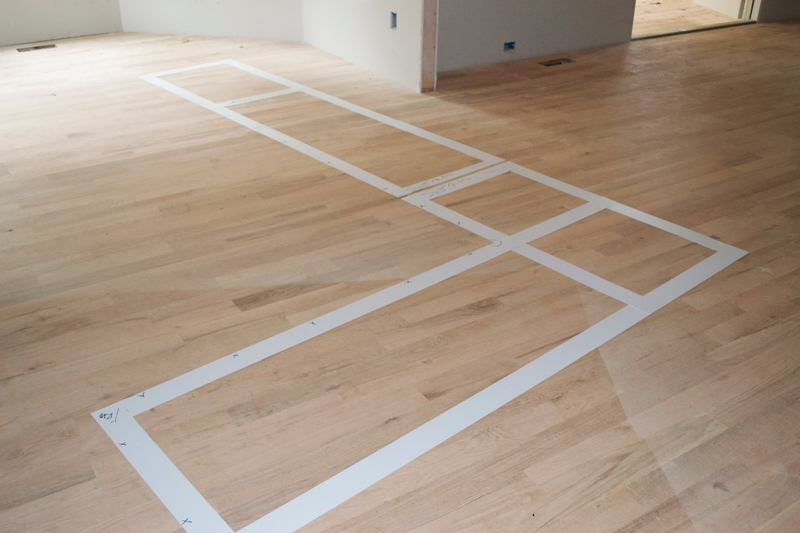 Use fast-setting glue and make sure it has set enough so you can continue laying down other strips without nudging any of the previous strips out of position. Once the glue has set, remove the countertop template in one piece for transport to the fabricator.